Britain's tax and benefits system must lose its "anti-marriage bias" if the UK's "broken society" is to be fixed, Tory leader David Cameron has said. He welcomed predecessor Iain Duncan Smith's social justice policy group report proposing 190 measures including tax breaks for some married couples. He would not be "instantly picking and choosing" policies but wanted to hold a "serious debate" on the ideas. Labour says the plans will discriminate against lone and unmarried parents. The policy group set up by Mr Cameron and led by Mr Duncan Smith called for the "biggest shake-up of the welfare system" since the 1940s. It says "social breakdown" is costing the UK £102bn a year. Among its proposals is a transferable married couples' tax allowance, worth around £20 a week, aimed at making it easier for one parent to stay at home to look after children. The report suggests allowing parents to "front load" child benefit, getting up to £2,800 a year up to the age of three and less when the child is older. It also proposes increase couples' allowances through working tax credits, giving up to 1.8 million couples an extra £32 a week. The report says the current tax system "does not recognise the benefits of marriage" and "disincentivises adults from openly living together and encourages fraud". But it promises not to "promote marriage at the expense of single parents". In a speech responding to the report, Mr Cameron said: "If we get the family right, we can fix our broken society. "Britain is almost the only country in Europe that doesn't recognise marriage in the tax system. "And the benefits system actively discourages parents from living together. "We have the highest rate of family breakdown in Europe. And we have the worst social problems in Europe. Don't tell me these things aren't connected." The report - called Breakthrough Britain - says lone parents on benefits should be expected to work part-time when their youngest child reaches five, and full-time when the child turns 11. It proposes courses for mothers and fathers to help with their children's development and "relationship classes". Mr Cameron said: "Some ideas could be implemented quickly and easily; others are more complex and would take more time and effort. "The reality of government is that you can't 'have it all'. "You have to make hard choices between different, sometimes competing priorities. "I won't pretend that I can wave a magic wand and solve all our problems overnight." Mr Duncan Smith said his proposals were "practical" and that he was not "moralising" in his support for marriage. 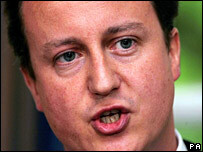 Mr Cameron said teenage pregnancy, violence, debt, drug and alcohol abuse and poverty had to be tackled. He accused Prime Minister Gordon Brown of perpetuating "the anti-marriage bias in our tax and benefits system". Mr Cameron said: "It's often said that over the past 10 years Britain has become a more tolerant country, and I welcome that. "It's good that we're more tolerant of social change. But I believe we have become far too tolerant of social failure." But Cabinet Office Minister Ed Miliband said Mr Duncan Smith's proposals would "discriminate against some children" in its tax policy, adding: "I don't think it's right for politicians to come on and preach." Chief Secretary to the Treasury Andy Burnham said the proposals offered "no real help to hard-working families", but were "a series of unfunded spending commitments which would cost over £10bn, with no idea where the money is coming from". He added: "This is a con from David Cameron because, despite his warm words, he does not have the money to pay for his proposals." Liberal Democrat education and families spokesman David Laws called the plans "a rag bag of old Tory party policies with a thin coat of new paint".